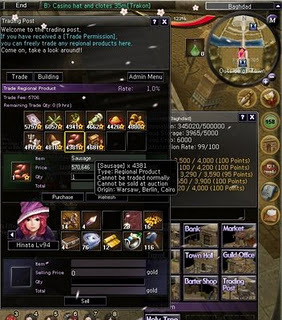 One of the most ignored features to make money in Atlantica Online is the trading post system. It becomes available to you at level 96. Using the basic economic principle of supply and demand, using Trading Post every 20 hours (that’s the cooldown) should net you around 25-50 million gold a day. Buy a TRADE PERMISSION from the Market (fixed price: 1 million gold). Right click to activate. Every town has a Trading Post. It can be seen in the Town Menu (where Market, Bank, Guild Office are). Every town PRODUCES 2 items. These items are in the FIRST 2 SLOTS of the Trading Post window. You should ALWAYS buy items from the ORIGIN TOWN. Every town PURCHASES 8-10 FOREIGN ITEMS. You should ALWAYS trade your goods if you are in a FOREIGN town. Example: MADRID produces COTTON PLANT and CACAO. So you should always buy COTTON PLANT & CACAO at MADRID, to sell elsewhere.